NEW DELHI (Reuters) – India’s Hindu nationalist ruling party vowed on Monday to strip decades-old special rights from the people of Jammu and Kashmir, making an election promise that provoked warnings of a backlash in the country’s only Muslim-majority state. It pledged to spend 100 trillion rupees ($1.44 trillion) on infrastructure in the next five years, to help create jobs for the millions entering the workforce each year. 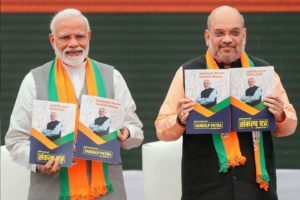 Pollsters say the BJP’s re-election bid got a boost from recent hostilities with arch-rival Pakistan, after a militant group based there claimed a February suicide bombing that killed 40 Indian security forces in the Himalayan region of Kashmir. “Nationalism is our inspiration, economic development of the poor and backward sections our philosophy, and good governance our mantra,” Modi said after releasing the election manifesto at BJP headquarters in New Delhi, as supporters chanted “Modi, Modi”. “In the last five years, we have made all necessary efforts to ensure peace in Jammu and Kashmir through decisive actions and a firm policy,” it said in the manifesto.